2016 Solo Exhibition China: Anhui Normal University Art Gallery 13th – 17th June Woodblock/digital Fusion Print series. 2016 ‘Scrounged’ – Art constructed from recycled, repurposed materials. Republic Plaza 370 17th St Denver Colorado USA. March 23 – May 19 2016. This exhibition is held in celebration of Earth Day. 2014 GYREx Exhibition. Anchorage Museum Alaska – early January 2014. Highlighting the global issue of marine debris. 2012 Powerhouse Museum Sydney : “Ecologic”: Creating a Sustainable Future. 2012 Kallalu Art Gallery Griffith St Coolongatta QLD. 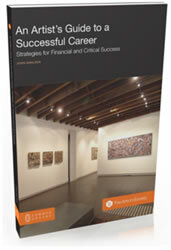 2012 Southwest Minnesota State University Art MuseumPermanent Collection. 2012 Miniature Museum of Contemporary Art: – Amsterdam The Netherlands. 2011 Community Art Gallery Circle on Cavil in Surfers Paradise from 9th – 30th July 2011. 2011 Kallalu Art Gallery Griffith St Coolongatta QLD. 2011 Powerhouse Museum Sydney: “Ecologic”: Creating a Sustainable Future. 2011 Southwest Minnesota State University Art MuseumPermanent Collection. 2011 Miniature Museum of Contemporary Art: – Amsterdam The Netherlands. 2010 – Amsterdam Art Fair. Represented by Ronen Art Vision Amsterdam October 2010. 2010 – ArtsCape Biennial Sculpture Exhibition. June 26th – July 11th 2010 Byron Bay NSW Australia. 2010 – Powerhouse Museum Sydney : “Ecologic”: Creating a Sustainable Future. 2010 – Miniature Museum of Contemporary Art: – Amsterdam The Netherlands. 2009 – Byron Bay Art Diary Launch Exhibition. 2009 – Powerhouse Museum Sydney : “Ecologic”: Creating a Sustainable Future. 2009 -Gallery 705 Stroudsburg, Pennsylvania. RECYCLE February 20 – March 27 , 2010. 2009 – Miniature Museum of Contemporary Art: – Amsterdam The Netherlands. 2008 – USA. 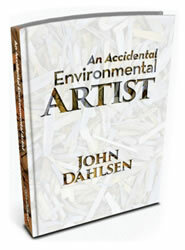 Lecture on Environmental Art: The work of John Dahlsen. Presented with a selected display of the artists work, at the Mystic Aquarium & Institute for Exploration. Mystic Connecticut. March 2008. 2008 – Pacific Bay Resort: Coffs Harbour NSW. 2008 – Miniature Museum of Contemporary Art: – Amsterdam, The Netherlands. 2007 – Miniature Museum of Contemporary Art: – Amsterdam, The Netherlands. 2006 – Firehouse Fort Mason Center, San Francisco “Gates Exhibition” – Dec 1 & 2. 2006 – Art For Action – Changing Nature Greenpeace Exhibition. 2006 – Miniature Museum of Contemporary Art: – Amsterdam, The Netherlands. 2005 – Southern Cross University: Next Gallery Lismore NSW “Mans Best Friend” April 5th – 22nd. 2005 – Samuel Dorsky Museum New York -“Recycled Revisited” exhibition, July 1 – Sept.18, – John Dahlsen invited to both curate and participate as an exhibiting artist. 2005 – Miniature Museum of Contemporary Art: – Amsterdam, The Netherlands. 2004 – Athens Olympics: ‘Artiade’ Exhibition – 12th August to 29th September Selected to represent Australia. 2004 – Milano Italy: at D’Ars Studio for Contemporary Arts, solo show, “John Dahlsen – New Work “- 4th May – 18th May. 2004 – Coffs Harbour Australia: John Gordon Gallery, solo show, “New Assemblages and Prints” -19th March – 17th April. NSW. 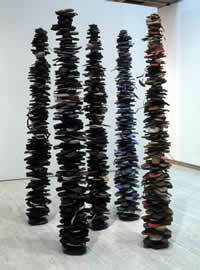 2004 – Art Gallery of New South Wales: Wynne Prize Exhibition 27th March – 16th May. NSW. 2004 – Sydney: Sculpture By The Sea: Bondi. 28th October – 14th November. 2004 – Lismore Regional Gallery: “Flood Sign” 5th Dec 2003 – 31st Jan 2004 NSW. 2004 – Casuarina Beach:Casuarina Sculpture Walk Invitation Exhibition NSW. 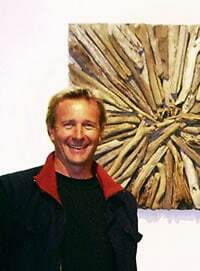 2004 – Wagga Wagga Art Gallery: Country Energy Art Award 10th Sept – 20th Oct NSW. 2004 – The Alice Prize: 6 – 28 Nov. Araluen Centre Alice Springs NT. 2004 – University of South Australia Art Museum SA: 6ft + Clean Surf and Art. 22nd April – 23rd May. A 2003 – 2004 Australian Regional Gallery travelling exhibition. 2004 – Miniature Museum of Contemporary Art: – Amsterdam, The Netherlands.